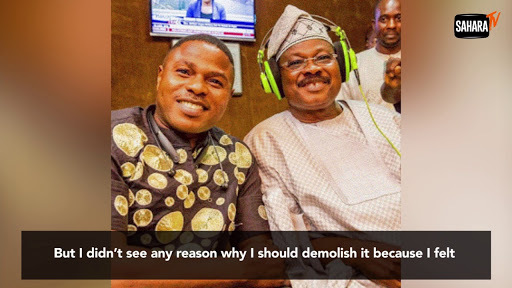 Ajimobi strikes Ayefele… | Ewolewoo!! The governor of Oyo state(Ajimobi) decided, in his infinite wisdom, to punish success. He decided to whither down the success of a man who beat physical disability to achieve what the able bodies just couldn’t. He just woke up this morning and decided to demolish part of the building that Yinka Ayefele built.. They wanted him destroyed. Man inhumanity to man you’d say.. I still recall, many years ago, Yinka Ayefele’s accident that crippled him. I can remember how almost all wrote him off. However, his tenacity refused to bulge. His inner fighting spirit led him to do what the cynics said was just impossible..He built a radio station and a studio. He employed people. He did this from his own sweat.This should have been a veritable example that the government of Oyo state could use to encourage people. No be so? However the Government just didn’t care. A combination of ego,outright jealousy with petty political mindset blinded any rational reasoning.They turned a hero to a villain just because of debilitating hate..Sad! That’s what I’ve always been saying..Once you’re a Governor in Nigeria you become God. That’s how the system works unfortunately. Being rational as a Governor is not a must it’s just a matter of discretion. Of course discretion is a matter of choice. The Governors in Nigeria don’t owe their workers or citizens any obligation because they have absolute immunity. In essence they don’t care. Oyo state Governor has just shown us how not to care.. If we don’t change the system that makes it possible for public officials to become Gods so shall this nonsense continue. A man that’s supposed to be celebrated is being messed up. An entrepreneur, with workers, is being chased out of town. That is called Nigeria incorporated.. I still remain as quiet as I can be…I lie?? Ewolewoo joor! !